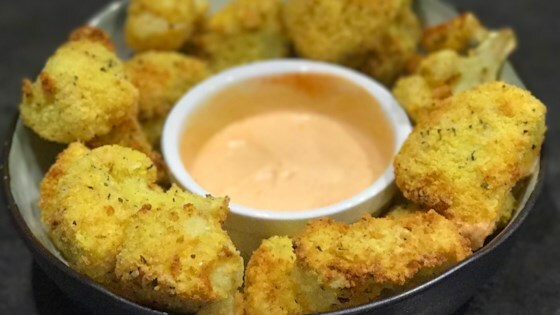 "Cauliflower dipped in bread crumbs and fried. Delightful. Serve with yogurt." Combine cauliflower and lemon juice in a saucepan; add enough water to cover. Cook until just tender, 15 to 20 minutes. Drain and let cool, about 10 minutes. Pour flour onto a plate. Beat eggs in a bowl until smooth. Mix bread crumbs, salt, and pepper in a shallow bowl. Dredge each cauliflower floret in flour, dip in eggs, and coat with bread crumbs. Heat oil in a deep-fryer or large saucepan. Fry cauliflower until golden brown, 2 to 4 minutes.